If the name might seem familiar it's because Toseland is a band fronted by double world superbike champion James Toseland. Throughout his career as a motorbike racer, music has been central to James life - so much so that he performed live at BBC's Sports Personality Of the Year. When James was forced to retire through injury a journey into music started? Fresh from the critical acclaim for debut EP "Life Is Beautiful", Toseland are set to release a new single, "Renegade", on the 13th October 2013. James put together a band including friend and guitar prodigy Zurab Melua (Guitars), Rabea Massaad (Guitars), Dave Hollingworth (Bass) and William Stokes (Drums) and took the material live. To have something available for punters to buy they put together an EP. With no push, as such, the lead track was picked up by Planet Rock radio and A listed. The word was out? New single "Renegade" is Toseland's first single proper - driving rhythms and the intricate guitars of Zurab Melua overlaid by the unique and powerful vocals of James Toseland. Toseland are proving themselves a powerful live act - in addition to a series of headline shows they have supported The Darkness, The Little Angels and appeared at Download Festival and Goodwood Festival Of Speed. The band has just been announced as main support for Reef's 20th Anniversary tour amongst other dates. 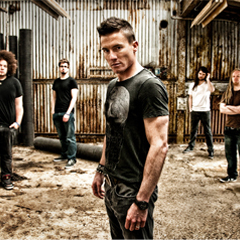 James Toseland says, "I am so excited to actually release my first single from the album. It has been an amazing journey writing with Toby and being able to perform my songs live around the country and get the feedback we have received from the gigs. I'm really looking forward to the music being out there so everyone can connect to the songs." Toselands debut album is set for release in early 2014.